Charlotte Strait, a large (20 Ã 100 km2) marine area separating Vancouver Island from the mainland. 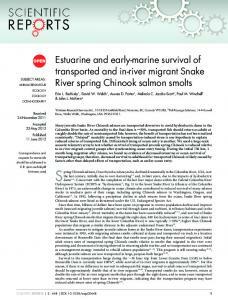 The results provide the first detailed data on the ocean biology of hatchery and wild ... from release point to recovery site is unclear. Although ..
Risks, requirements and estimation of a software project ... framework of reference for the process to manage risk and requirements, and to ..... This behaviour is all too frequent, as shown by the project accounts discussed in the statistics. LX-34B. "'4. SX-34BS. 6. SX - 410. 8. LX-420A. 10. SX - 800 , SX - 2000. ,. , , 12 ... 87 8 8. S A - 700/F , S A - 700/K. 9 0 9 1. S A - 900/F , S A - 900/KC. 94^95. SC. Market Pioneer and Early Follower Survival Risks: A Contingency Analysis of Really New versus Incrementally New Product-Markets Abstract Does the first entrant in a new market have a difficult time surviving or do first-mover advantages provide protection from outright failure? Our empirical study of 264 new industrial product-markets yields insights into this controversial research topic. The key data analysis insights arise by comparing survival risks in markets that were started with a really new product versus an incremental innovation. When the pioneer starts a new market with a really new product, it can be a major challenge just to survive. In contrast, in markets started by an incremental innovation, market pioneer survival risks are much lower. followers have the same survival risk across both types of markets. Overall, these results indicate that in markets started by a really new product, the first to market is often the first to fail. In contrast, in markets started by an incremental innovation, it appears that first-mover advantages protect the pioneer from outright failure. 3 relationship between order of market entry and survival. This complex relationship is also examined by Srinivasan, Lilien, and Rangaswamy (2004). They report that network externalities have a negative impact on market pioneer survival. While network externalities are important, our contingency analysis is based on product innovation newness. development that has received considerable research attention. For example, see Garcia and Calantone’s (2002) literature review on innovation types. Our contingency analysis compares survival rates for markets that were started with really new products versus incremental innovations. This is part of a continuing effort to shed light on different challenges which marketing managers face in really new versus incrementally new product-markets (e.g., Urban, Weinberg, and Hauser 1996; Song and Montoya-Weiss 1998; Schmidt and Calantone 1998). When a pioneer starts a new market with a really new product, the costs and risks are unusually high, which makes survival more difficult. Because early followers can learn from the pioneer’s mistakes, they are not as vulnerable to exit. In contrast, an incrementally new product typically has lower costs and risks, which makes it easier for the market pioneer to survive. In addition, a pioneer’s temporary monopoly plus their first-mover advantages should yield higher survival rates versus early followers. Our contingency analysis is tested using data from two sources. The Thomas Register of American Manufacturers is used to identify 264 new product-markets for industrial goods and to track market pioneer (first entrant) and early follower survival over time. It is supplemented by an expert survey that estimates product innovation newness for each of these 264 new markets. The expert survey classifies 66 markets as starting with a really new product and 198 as starting with an incremental innovation. 4 In the data analysis, consistent results surface between the descriptive statistics and a hazard rate model that accounts for both observed and unobserved heterogeneity. The results reveal that market pioneers who launched a really new product have much lower survival rates than pioneers who launched an incremental innovation. survival rate for really new products is only 23% versus 61% for incremental innovations. One surprising result is that early followers do not have meaningful survival risk differences in really new versus incrementally new product-markets. For example, the 12-year survival rates in really new versus incrementally new product-markets are essentially equal at 38% versus 39%. This indicates that in really new product-markets, early follower learning from the market pioneer’s experience can materially reduce their survival risk. The research controversy described above can be resolved by examining survival risk differences within really new and incrementally new product-markets. In incremental innovation product-markets, the market pioneer has a consistently higher survival rate versus early followers. An opposite result occurs in really new product-markets, where the market pioneer has a lower survival rate. Overall, the key research conclusion is that the market pioneer is more likely to be the first to fail when it starts a new market with a really new product, but not when it starts the new market with an incremental innovation. Survival Risk Hypotheses The hypotheses below highlight survival risks for market pioneers and early followers. The first two hypotheses compare survival risks across markets that were started by the pioneer’s really new or incrementally new product. The third and fourth hypotheses address survival risk within each type of market by comparing market pioneers to early followers. 5 Really New versus Incrementally New Product-Markets To assess product innovativeness, we follow Urban, Weinberg, and Hauser’s (1996) dichotomy of really new versus incrementally new products. They state, “Really new products shift market structures, represent new technologies, require consumer learning, and induce behavior changes” (p. 47). At the other end of the spectrum, an incremental innovation is designed to satisfy a felt market need and uses an existing technology or refinement of it. Really new products such as automobiles and personal computers utilize new technologies to elicit new market needs. Agarwal and Bayus (2002) point out that really new products are often unreliable and costly when they first appear on the market. Because of high levels of market and technological uncertainties, they face slow acceptance by potential users. A key source of market uncertainty arises from customers’ concern about the new product’s ability to deliver all its promised benefits. complementary hardware (e.g., roads for automobiles) or software technologies (e.g., programs for personal computers), often supplied by an independent third party, whether government or industry (Olleros 1986). Potential customers often delay adoption of a really new product until the complementary technologies become available. Really new products often entail high technological uncertainty. Potential users tend to be concerned whether a market will eventually adopt the technical standards embodied in the really new product. Also, when a dominant product design emerges for a really new product, the dominant design can take years to emerge (Christensen, Suarez, and Utterback 1998). If so, when the pioneer is committed to another product design which customers do not want, its survival can be threatened. H1: Market pioneers have higher survival risk for really new versus incrementally new products. H2: Early followers have higher survival risk for really new versus incrementally new products. H3: For really new products, market pioneers have a higher survival risk versus early followers. H3a: For really new products, market pioneers have a lower survival risk versus early followers. H4: For incremental innovations, market pioneers have a lower survival risk versus early followers. H4a: For incremental innovations, market pioneers have a higher survival risk versus early followers. Data The Thomas Register data have been used in numerous survival studies. Examples in the economics literature include Gort and Klepper (1982), Agarwal (1997), and Agarwal and Gort (1996, 2001). 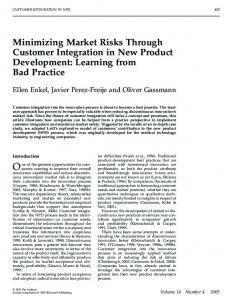 In the marketing literature, it has been used by Agarwal and Bayus (2002) and Robinson and Min (2002). The Thomas Register is a national buying guide that provides “a comprehensive detailed guide to the full range of products manufactured in the United States” (Lavin 1992, p. 129). The Thomas Register attempts to achieve comprehensive coverage by subscribing to a broad range of industry newsletters, searching for start-up ventures in university incubators, and by providing a free listing in each annual issue. For instance, the 2003 Thomas Register includes approximately 173,000 firms and more than 65,000 product categories. A key Thomas Register data strength is that the market boundaries are buyer-driven. To help industrial buyers, a new product category is typically added to a group of closely related categories. A new category does not split an existing category. For example, an industrial buyer searching for valves will find air valves, nuclear valves, frost-proof valves, solar collector draindown valves, etc. 12 The Thomas Register’s professional staff determines market boundaries and the relevant competitors in each market. The Thomas Register market boundaries are narrower than Golder and Tellis (1983), who include broad categories like microwave ovens, cereal, and soft drinks. They are typically broader than Urban et al. (1986), who examine consumer packaged goods such as light beer, antacids, and steak sauce. Because it is a national buying guide, the Thomas Register typically excludes firms with exclusively local sales. national markets. In terms of scale of entry, this operational definition falls between Urban et al. (1986), who require national distribution and Golder and Tellis (1993) who include local markets. New markets are identified by comparing annual editions of the Thomas Register from 1960 to 1995. A new market is identified when it is listed in one year, but not in prior years. Identifying 264 new industrial markets was the most time consuming part of the data collection process. 13 returns. For example, greater differences should arise between the market pioneer and an early follower than between two later entrants. A second data limitation arises from our definition of exit. We follow Agarwal’s (1997, p. 574) guidelines with an exit arising when the firm’s name and address are both missing from the product category in a given year. This avoids the problem of confusing an exit with a name change, such as a conglomerate merger, or confusing an exit with an address change from office relocation. Even so, when a successful firm is merged or acquired, its name and address are often changed. In this case, it is classified as an exit. Because exit implies failure rather than success, this limitation surfaces in the other Thomas Register survival studies cited above. In an attempt to quantify this potential bias, we gathered additional data for the most recent Thomas Register exits that arose between 1994 and 2002. There were 178 product exits during this nine year period (see Table 1). Cases were then identified when a firm exit arose in the same year as the product exit. A firm exit arises when a firm is de-listed from the Thomas Register. This approach assumes that when a merger or acquisition occurs, a product exit and the firm exit arise in the same year. In Table 1, only 25% of the product exits were accompanied by a firm exit. Also, there are no meaningful differences associated with either order of entry or product innovation newness. Some additional insights are provided for the 45 cases when a product exit and the firm exit arise in the same year. These insights are based on a Google search, an Internet search for bankruptcy court filings, and by calling the most recent telephone number listed in the Thomas Register. important to know if the acquired firm was successful or unsuccessful in the product category that was being tracked. Successful product category performance should not be classified as an exit, whereas unsuccessful performance can be classified as an exit. While there is not enough data to determine success at the time of exit, we assume that when product category performance is successful, the acquiring firm should remain active in the product category through 2002. (This is roughly three years after the acquired firm’s exit.) In Table 1, the acquiring firm remained active in the product category for only 2 out of the 10 mergers and acquisitions. This suggests that even when a Thomas Register exit arises from a merger or an acquisition, the acquired firm is more likely to be struggling than successful. Overall, these results indicate that mergers and acquisitions of successful firms do not seriously bias the Thomas Register exit measure. Key Definitions In each product-market, the market pioneer is defined as the market’s first entrant. Since our research compares market pioneers to early followers, our analysis excludes markets with multiple first year entrants. This is because a unique first entrant (market pioneer) cannot be identified. When a unique first entrant is identified, the market is tracked forward on an annual basis until another entrant is identified. This entrant and any other entrants in that year are called early followers. For the 31 cases with unknown outcomes, the acquired firm could not be contacted by calling the most recent telephone number listed in the Thomas Register. Because successful firms should attempt to maintain telephone contact with established customers, this outcome seems more likely to arise for unsuccessful firms. 15 Industry and research experts were surveyed to estimate the degree to which each new product-market was started with a really new product or an incremental innovation. 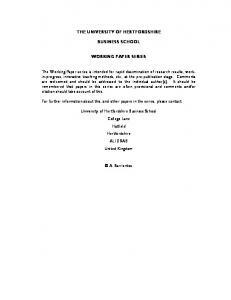 Urban, Weinberg, and Hauser’s (1996) conceptual distinctions were read and understood. In these conceptual distinctions, a really new product creates a new market, relies on new technology, and requires customer learning. An incrementally new product is designed to satisfy a felt market need and uses an existing technology or refinement of it. In the rating scale designed to elicit the newness of a product innovation, 1 is an incremental innovation and 7 is a really new product. Table 2 provides the survey questionnaire for chemicals and allied products. For each of the 264 new markets, four to nine experts rated the degree of product innovativeness when the new market started. Fifteen of the 39 experts had a Ph.D., most had industry work experience, and all were pursuing scientific research. employed in a research oriented university which has most of its engineering departments ranked in the top 20 nationally. Each expert only evaluated products in their field of expertise.2 To the best of our knowledge, the experts gave ratings that were internally consistent across the product categories. Even so, in the questionnaire pretest, some experts in basic research labs gave consistently low ratings for the degree of product innovativeness. To control for this bias, our final survey included some well-known really new products that serve as benchmarks. These benchmarks were mainly derived from earlier research studies. The surveys were done in person. While it was not part of the formal survey, in most cases, the expert could not identify the market pioneer or the first early follower. This may arise because the average year of market inception was in the 1970s. Thus, it does not appear that early entrant survival knowledge biased the degree of product innovativeness measure. 16 laser jet printer, Walkman, Web TV (Urban, Weinberg, and Hauser 1996), transistors, electric shavers, and radar detectors (Gort and Klepper 1982). To adjust for individual response bias, the first step computes each respondent’s benchmark score, which is the average score across the well-known really new products. The second step subtracts the respondent’s benchmark score from the corresponding raw score. For each expert, a product is considered really new when the raw score is greater than or equal to the benchmark score. A product is classified as really new when the majority of experts agree that a given product is really new. This procedure yields 66 really new products and 198 incremental innovations. To quantify the reliability of the product innovation newness measure, Cronbach’s α estimates the average correlation in inter-expert ratings. Table 3 reports the results across twodigit SIC code industries. Cronbach’s α ranges from 0.76 to 0.96, which indicates an acceptable degree of reliability. Overall, the benchmark adjustment to the product innovativeness measure appears to reduce individual response bias. This is because it yields a reliable measure and tends to strengthen the hazard rate modeling results below. 17 this conclusion applies to the entire sample, more accurate insights arise by comparing really new product-markets versus incremental innovations. In our sample, the really new product-markets have 66 market pioneers and 146 early followers. The incremental innovation product-markets have 198 market pioneers and 340 early followers. The average year of market inception is 1978 for really new products and 1975 for incremental innovations. monopoly, is only 2.5 years. Table 4 describes the sample in terms of two-digit SIC codes and new product newness. The really new products include thirteen chemical products such as gelling agents, cellulose propionate, indium compounds, dielectric gas, parylene, etc. Really new products in other industries include voice activated microphone, osmometers, blood pressure monitors, video microscopes, bomb detectors, and computer screen projectors. The incremental product-markets include welding nozzles, poultry chillers, asphalt concrete, boat coolers, bottle sorters, fiberglass washers, boat loaders, and ice dicing machinery. The appendix provides a complete list of the product-markets, the year of market inception, and the degree of product innovativeness. Using 4, 8, and 12-year survival rates, Table 5 provides initial hypothesis testing insights. Longer time horizons are not used because right-censoring problems limit the sample size. Twelve-year survival rates provide the most information, so they are highlighted below. For H1, 12-year survival rates for market pioneers are much lower for really new products than incremental innovations. At 23% versus 61%, incremental innovation survival rates are almost three times higher versus really new products. This difference can be explained by the greater market and technological uncertainties that pioneers have to overcome when they launch a really new product. This result provides strong support for H1. 18 For H2, it is surprising that there are no meaningful survival rate differences for early followers in really new versus incrementally new product-markets. This result is also surprising because these early followers typically entered the new product-markets only two to three years after the pioneer. This suggests that early followers benefit from the efforts and experience of the pioneer in overcoming market and technological uncertainties. For H3, market pioneers in really new product markets have significantly lower 12-year survival rates than early followers, 23% versus 38%. For H4, an opposite sign arises with market pioneers having significantly higher 12-year survival rates (61% versus 39%). The higher levels of market and technological uncertainties in really new product markets, which should decrease market pioneer survival rates, can explain this sign reversal. Two industry examples help illustrate these results. A voice activated microphone was classified in our expert survey as a really new product. It was pioneered by Sherwood Communications Associated Ltd. in 1992. It entered the market as a startup business with roughly one million dollars in assets. It exited the market in 1993, which is the same year the first early follower, Telephonics Corporation., entered. Telephonics was an industry incumbent, which had experience in manufacturing headsets and microphones. Its asset size was over $250 million. Telephonics survived through 2002 and was one of active players in the market. A second example is a welding nozzle, which in our expert survey classified as an incrementally new product. It was pioneered by Maryland Ceramic and Steatite Co. in 1987, which was an industry incumbent with over one million dollars in assets. In 2002, it was one of 22 market survivors. The first early follower was Lurmark Ltd., a start-up business. It entered the market in 1990, but exited in 1993. Hazard Rate Analysis While descriptive statistics are useful, a multivariate hazard rate analysis provides more accurate hypothesis testing results. A hazard rate is the conditional likelihood of a firm’s failure in time period t, given that the firm has survived through time period (t-1). Two widely recognized benefits of a hazard rate analysis are: (i) representing the impact of time varying explanatory variables on a firm’s likelihood of failure, and (ii) addressing the right censoring problem (Helsen and Schmittlein 1993, p. 397). Right censoring occurs when a firm does not have a completed spell within the data observation window and all that we know is that its survival duration lasted from the time of its market entry until the end of the observation window. Because our data are annual observations, we employ a discrete hazard rate model which incorporates the impact of time varying covariates (e.g., competitive firm density in a product-market) on a firm’s likelihood of failure. We model the impact of time on a firm’s likelihood of failure non-parametrically in order to capture any arbitrary pattern in the firm’s baseline hazard rate over time (see, for example, Han and Hausman 1990; Meyer 1990). In other words, we assume the baseline hazard rate function is a step function of time that is constant within a year but is allowed to vary from one year to another. An advantage of this approach is that it allows consistent estimation of the effect of explanatory variables for arbitrary underlying baseline hazard functions. Finally, the hazard rate model incorporates the impact of unobserved heterogeneity on firm hazard rates. In the hazard rate model,3 let t denote the survival duration of an entrant with the cumulative probability distribution function F(t). Vanhuele et al. (1995) use the same hazard rate model to analyze marriage dissolution data. Their paper has a more complete hazard rate model description. where h(ti) is the hazard rate function representing the chance of firm i’s exit in the t ith period given it has survived through the period ti-1. 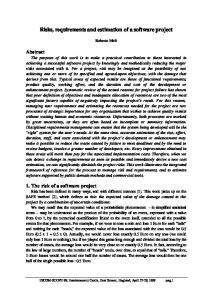 We now explain our derivation of the expression for hazard rate function, h(ti). We will then obtain an expression for the associated survival function S(ti-1). where λ0 is the base hazard rate, ϕ (t i ) is a step function which captures time (or age) dependence of the hazard rate, and φ ( X i (ti ) ) is a time-varying covariate function. 22 covariate will enhance the likelihood of firm failure. increases by one, the conditional probability of firm failure changes by [exp(βˆ j ) − 1] × 100% . Substituting for the terms ϕ (t i ) and φ ( X i (ti ) ) from Equations (4) and (5) in Equation (3), we obtain h(t i ; X i (t i )) = λ0 exp[C t D(t i ) + β X i (t i )] . H (t i ) = ∫ h(u )du . While our time-varying covariates (e.g., competitive firm density in a product-market) can change from year to year, we assume they remain constant within each year. S (t i ; Bi (t i )) = exp[− λ0 Bi (t i )] . 24 giving the r parameter, the interpretation that a low (high) r-value suggests relatively more (less) heterogeneous population. Table 6 provides the variable definitions, means, and standard deviations for the full model specification. Key model specification variables used in the hypothesis testing are the really new product-market dummy variable, a market pioneer dummy variable, and a really new product-market * market pioneer interaction term. All the control variables are discussed below. Conventional Economic Variables: Geroski’s (1995) literature review suggests that the likelihood of survival is greater for larger firms than for smaller firms. The Thomas Register includes the tangible asset size for each firm. Because the average tangible asset size varies over industries and has changed over time, entrant size is divided by its industry average. The industry is defined at the two-digit SIC code level. Incumbents are likely to have higher survival rates than start-up ventures because of their prior experience, market knowledge, brand equity, and customer relationships. 25 considerably across different industries. Thus, the hazard rate model also includes four industry specific dummy variables. Population Ecology Variables: Population ecologists predict two contrasting effects of “density dependence” on firm hazard rates – legitimation and competition (Hannan and Freeman 1989, Hannan and Carroll 1992). Legitimation of a product innovation increases as the number of firms in the new product-market increases, thereby resulting in the decline of hazard rates of all firms. There is, however, a ceiling on the impact of the legitimacy process. At higher levels of firm density, legitimation reaches a saturation level and the competitive effect of firm density dominates, resulting in higher hazard rates for all firms. Overall, the population ecology theory predicts a U-shaped relationship between firm density and hazard rate in new product-markets. Hence, the hazard rate model includes a firm density and a firm density squared term.4 Density dependence theory also predicts a persisting competitive effect of firm density at the time of a firm’s entry into a product-market. Carroll and Hannan (1989) attribute this effect to two sources, “resource scarcity” and “tight niche packing.” They contend intense competition at the market entry creates condition of resource scarcity. With scarce resources, market entrants that find it difficult to move to full-scale operation face strong selection pressures. A second consequence of intense competition at the time of market entry, they argue, is tight niche packing. Because market entrants seldom compete head-to-head with market incumbents, they are forced to pursue marginal target-market opportunities. Carroll and Hannan (1989), Carroll et al. (1996), and Banbury and Mitchell (1995) provide empirical evidence supporting the adverse impact of firm density at the time of market entry on the probability of firm survival. To adjust for differences across product markets, firm density is normalized by dividing it by the average number of competitors over the 10-year period following the end of the pioneer’s monopoly. + β 4 Ln LeadTime ) − β 5 Ln LeadTime + β 6 Ln LeadTime 2 , tests H4. negative and significant, it supports H4 and indicates that pioneers experience lower hazard rates for incremental innovations than early followers. 28 higher survival risk for really new versus incrementally new products. Specifically, the survival risk of market pioneers is 189% ([exp (1.06) –1] * 100%) higher for really new versus incrementally new products. Recall there is almost a threefold difference in the 12-year pioneer survival rate for really new versus incrementally new products, 23% versus 61%. This indicates that for market pioneers, the challenge of resolving market and technological uncertainties in really new product-markets often outweighs the benefits of first-mover advantages. H2 predicts a higher survival risk for early followers in really new product-markets. In Table 7, the estimate has the expected sign, but is not statistically significant. This result is consistent with the descriptive statistics where 12-year early follower survival rates are 38% for really new versus 39% for incrementally new products. These results indicate that the typical two to three year delay in entering a really new product market helps an early follower resolve key market and technological uncertainties. 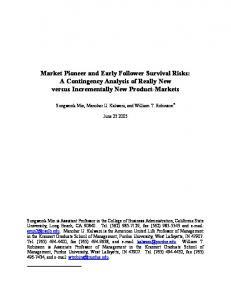 For really new products, H3 predicts that market pioneers have a higher survival risk than early followers. At the bottom of Table 7, the difference is tested at the average pioneer leadtime level of 1.98 years for the really new product sample. It is statistically significant at the 10% level. This difference is also managerially significant with a 54% ([exp (.43) - 1] * 100%) higher survival risk than early followers. 29 the 5% level. This supports the prediction that for incrementally new products, market pioneers have a higher chance of survival. Turning now to the coefficient estimates of the control variables, they all have the expected signs. The impact of leadtime on the pioneer survival chance has the expected negative sign and is statistically significant at the 13% level. This indicates that increasing pioneering leadtime reduces a market pioneer’s survival risk. The results support a U-shape relationship between an early follower’s hazard rate and pioneer leadtime. Thus, a short delay appears to help an early follower, but an additional delay increases an early follower’s survival risk. Incumbency significantly decreases survival risk. Further, the calendar year of market inception has the expected positive sign and is statistically significant. This indicates increasing survival risk in markets started in recent years. There is also a significantly higher survival risk in years of economic decline. The estimates of θ 1 and θ 2 show the impact of firm density on a firm’s hazard rate. As expected, the estimates for θ 1 and θ 2 are negative and positive respectively. Both estimates are statistically significant at the 1% level. increase in the number of firms increases its legitimation, thereby lowering firm hazard rates. At higher levels of firm density, legitimation reaches a saturation level and the competitive effect dominates with an associated adverse impact on firm survival rates. As predicted, the estimate of θ 3 is negative and statistically significant at the 1% level. This indicates that an increase in firm density at the time of market entry elevates a firm’s hazard rate. Population ecologists attribute this result to the liability of resource scarcity and to tight niche packing, which makes it difficult for an entrant to find profitable positioning opportunities. Robustness of Results Because theory does not provide clear guidance on the functional relationship between the degree of product innovation newness and survival, two additional functional forms are considered below. The first maintains the dichotomy used above, but only considers a product as really new when every expert classifies it as really new. This differs from the measure above which is based on the majority of expert opinion. When every expert classifies a product as really new, our sample has 30 “really” really new products. The second functional form uses a continuous measure of product innovation newness. This follows research such as Chandy and Tellis (1998) and Chandy and Tellis (2000) whose measure of radical product innovations is continuous. Our continuous measure equals the difference between the expert’s rating and the expert’s average benchmark rating. differences are averaged across the experts who evaluated each of the 264 new markets. Table 8 provides the hypothesis testing results for these alternative functional forms. Model I tests the dichotomy between “really” really new products and incremental innovations. (The 36 really new product markets that do not have uniform expert support are excluded from the data analysis.) Model II uses the continuous measure of new product newness. Overall, the hypothesis testing results are consistent using all three measures of product innovation newness. This is because the results consistently indicate that market pioneers have higher hazard rates in markets that were pioneered with a really new product, but lower hazard rates in markets that were pioneered with an incremental innovation. In addition, there is no material difference between early follower hazard rates in really new versus incremental innovation markets. Dynamic Survival Risk Insights While the hazard rate model above yields important survival risk insights, it does not pinpoint how survival risk changes over time. Two types of dynamic insights are developed below. The empirical hazard rate equals the number of firms that failed in year t divided by the total number of firms that were at risk year t-1. Because empirical hazard rates do not partial out the impact of additional explanatory variables or correct for unobserved heterogeneity, predicted hazard rates are also provided. The predicted hazard rates are based on four hazard rate models. The four models are estimated for market pioneers (n=66) and early followers (146) in really new product-markets plus market pioneers (n=198) and early followers (n=340) in incrementally new markets. The full model specification includes Table 7’s additional explanatory variables. incremental innovations sample is larger, annual dummy variables for the first 12 years of commercialization are used versus 10 years for the smaller really new product-markets sample. For really new product-markets, Figures 1a and 1b display the empirical and predicted hazard rate plots. These figures illustrate how hazard rates for pioneers and early followers are initially similar, but then diverge. 32 can arise when market pioneers benefit from their temporary monopoly in the first two or three years of commercialization. Also, because first-mover advantages often dissipate over time (Robinson 1988), it is not surprising that hazard rate differences narrow with the passing of time. Even so, market pioneers have consistently lower hazard rates versus early followers. 33 benefit from the prior efforts of the pioneer in building primary demand. They can also benefit from the pioneer’s experience in addressing customer needs and concerns which can become public knowledge through professional and trade journals (Gort and Klepper 1982). Finally, early followers are more likely to leapfrog the pioneer in really new product-markets that often undergo significant product improvements during the emergent stages (Christensen, Suarez, and Utterback 1998). In addition to highlighting the survival risks of pioneering really new product-markets, these empirical results help resolve an ongoing controversy in the order of market entry literature. The controversy is whether the first to market is the first to fail. In really new product-markets, the hazard rate modeling plots show that higher market pioneer survival risks tend to surface after six or more years in the market. This can arise when it takes a few years for a market pioneer to see if their initial investments, which were made in the face of great uncertainty, are on target. For incrementally new product-markets, the hazard rate modeling plots show that market pioneers have lower survival risks versus early followers. While these survival risk differences narrow over time, market pioneers have consistently lower survival risk. This can be explained by the pioneer’s initial monopoly, which increases survival rates in the first two to three years of commercialization. Also, pioneer first-mover advantages are often strongest in the early years of a market’s evolution and these advantages help protect the pioneer from outright failure. In conclusion, market pioneers are often the first to fail in really new product-markets. This is not true in incrementally new markets, where market pioneers have consistently lower survival risks versus early followers. Four research limitations and the associated future research topics are discussed below. First, our sample is only composed of industrial goods markets. Different results could surface in different types of markets. For example, incremental innovations in high-technology markets may not generate meaningful pioneer survival benefits versus early followers. This is because a pioneer’s survival can be threatened by a higher degree of technological uncertainty. Second, our sample only contains 66 really new product-markets. While this sample size compares favorably with other survival studies, a larger sample size would yield more precise insights into market pioneer survival risks and how these survival risks change over time. Third, our product innovation newness measure is applied decades after the new markets started. Major investments in new products though arise prior to product launch, perhaps even at the prototype development stage. Thus, during the product development process, managers need a different type of measure to distinguish really new from incrementally new products. Fourth, optimal entry timing requires greater insights into fast followers versus slow followers. For example, how long should an early follower wait before attempting to enter a new market? While the Thomas Register data can address this research topic, it will require an expanded sample size plus an objective way to distinguish fast followers from slow followers. While profit data would yield valuable research insights, it is not provided in the Thomas Register. Profit data are available in PIMS, but the business unit and product category are both disguised. With disguised product categories, really new and incrementally new product markets cannot be identified. Thus, we do not know of any profit data that can be linked to really new versus incrementally new product-markets. 36 pioneer market share rewards. For examples, see Kalyanaram, Robinson, and Urban’s (1995) survey and VanderWerf and Mahon’s (1997) meta-analysis. With the majority of new markets being pioneered by incremental innovations, it is likely these market share reward studies are dominated by incremental innovation markets. If so, pioneers of incremental innovation markets should benefit from higher survival rates plus sustainable market share advantages. *This is a part of the questionnaire for chemicals and allied products. The actual survey questionnaire includes 34 chemical and allied products. Report "Market Pioneer and Early Follower Survival Risks: A ... - CiteSeerX"